Last weekend I was outside working in the backyard when I noticed a Giant Swallowtail butterfly nectaring in my firebush. (There was a hummingbird in that firebush a few days before!!) 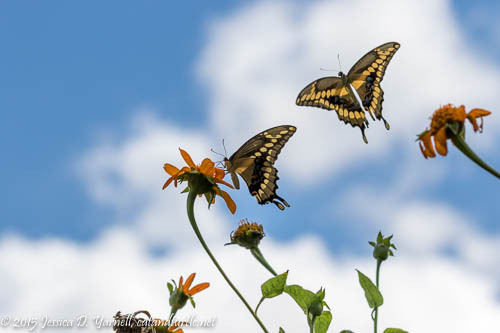 Butterflies are pretty common in my backyard, so I smiled and kept on working. 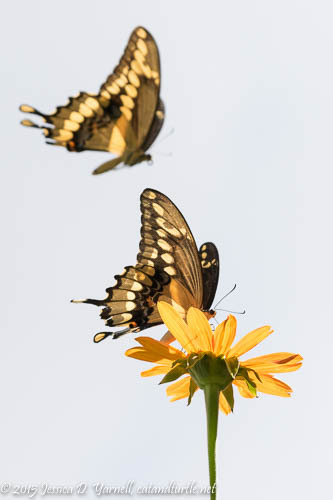 Then I noticed that my Giant Swallowtail had a friend. 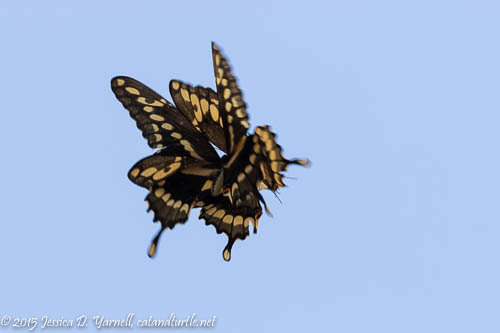 A second butterfly was flitting desperately trying to attract the attention of the first. Rich grinned at me as I burst inside to grab my camera. It’s been way too long since I’ve had time to use it! Pretty soon the butterflies moved from my firebush to one of my Mexican Sunflower bushes. 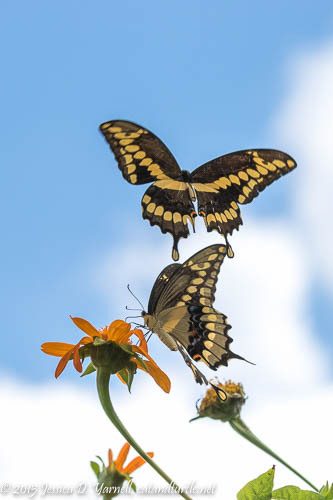 Boy do the butterflies, bees, and hummingbirds love the nectar of the Mexican Sunflower! It’s convenient that the plant self-seeds, showing up in the early summer where bushes grew in the previous summer. This year I transplanted several plants all over the yard, so there’s a ton of nectar everywhere you fly. Then they came back down and continued nectaring. 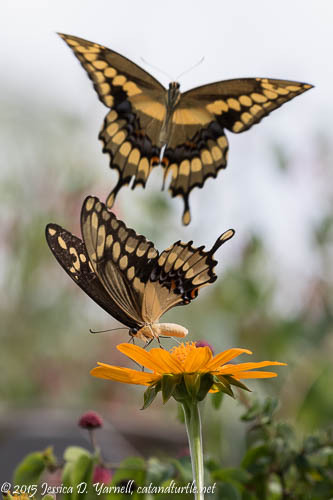 I think the girl butterfly was more interested in nectar than romance. But the boy butterfly wasn’t taking no for an answer. I enjoyed my opportunity to have two such cooperative subjects in the frame. But the skies started to gray up and the thunder started to rumble in the distance, reminding me of the yardwork that wasn’t going to finish itself. I managed to get the rest of the bushes trimmed and stacked down at the curb just as the first raindrops fell!